On 27 October 1942, four "Long Lance" torpedoes fired by the Japanese destroyers Makigumo and Akigumo exploded in the hull of the aircraft carrier USS Hornet (CV-8). Minutes later, the ship that had launched the Doolitte Raid six months earlier slipped beneath the waves of the Coral Sea. Of the pre-war carrier fleet the Navy had struggled to build over 15 years, only three were left: Enterprise, that had been badly damaged in the battle of Santa Cruz; USS Saratoga (CV-3) which lay in dry dock, victim of a Japanese submarine torpedo; and the USS Ranger (CV-4), which was in mid-Atlantic on her way to support Operation Torch. For the American naval aviators licking their wounds in the aftermath of this defeat, it would be difficult to imagine that within 24 months of this event, Zuikaku, the last survivor of the carriers that had attacked Pearl Harbor, would lie at the bottom of the sea. Alongside it lay the other surviving Japanese carriers, sacrificed as lures in a failed attempt to block the American invasion of the Philippines, leaving the United States to reign supreme on the world's largest ocean. 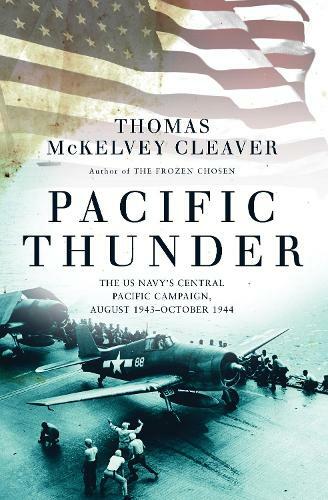 This is the fascinating account of the Central Pacific campaign, one of the most stunning comebacks in naval history as in 14 months the US Navy went from the jaws of defeat to the brink of victory in the Pacific.